or.. maybe not so much..
the only wherewithal we might have to rely on is the quality of our feelings and thinking brought together through the habit of ‘practice and serendipity’ or simply having a ‘prepared attentive mind’ since the need is to adapt moment to moment. Or simply stated, our contextual intelligence can come to our rescue to maintain balance. Nemetics is a flexible thought model that allows us to synthesize mathematical thinking, subjective insights and feelings to re-design our lives for the better. The objective of the flexible thought model is to make sense of complex adaptive systems and to act upon them. It may be effectively applied to various fields like organizations, manufacturing systems, engineering, organizational sociology, economics, design, system design, system reliability and even to psychology and a host of others fields. or people. 7 billion+ of them.. no? perhaps we’re missing the dance.. because we keep looking elsewhere for the dance steps.. when they (the steps, the music, the sync-ability) is already inside each one of us..
when many oscillators couple together they form a general group pattern. Appearance of such a group pattern is what is known as ‘emergence’. 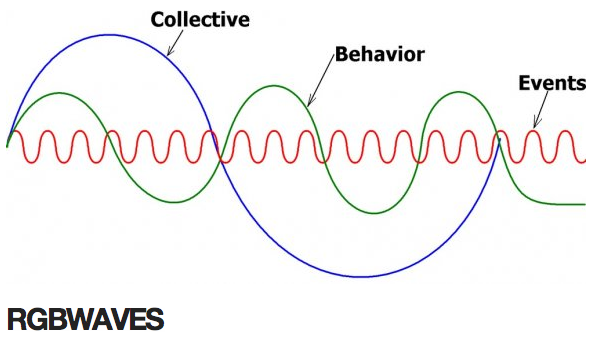 Thus our task perhaps simplifies to understanding and interpreting such patterns exhibited by group behavior, which are simply known as emergence. again – serendipity et al… not about the prep/design of a space/structure/system as we generally view these things (ie: design classroom or office space or even city, et al). but about the bravery/freedom/openness/awakeness/aliveness..trust.. to let it/us emerge. listen/emerge/listen.. all one dance of improv. no prep. as prep. which is great news.. we don’t have to have years of training, or mounds of manuals/policy/bureaucracy, or only let certain credentialed people be in charge of the day. we just have to free people. and trust that. let’s do that first. and just see. we’ve spent plenty of years doing it the other way around. no? Hence faced with an issue on ‘interdependence’ we have two tasks ahead of us. First is to understand and interpret the group behavior and patterns that emerge. There are several ways of going about it. One of my favorite is to see the wave patterns generated. The idea is to identify the type of wave and the type of attractor that it might be associated with. like the vision/thinking of David‘s vest.. another sense – learning to grok. tacit ness. The wave based communication of Humans is far more limited than crickets, seen in places like dance clubs, prices in stock markets (less total stocks than neurons in a small number of crickets brains), body language, etc, but these wave based communications of Humans do not tend to spread to other Humans nearly as well as oscillating sounds spread in large groups of crickets. Humans communicate mostly in words. Crickets communicate mostly in waves. There are waves of words as ideas flow through society, which we call memes, but at the brainwave level we are still communicating between brain cells like crickets communicate with sound. but words are man made … no? so maybe we go with way more or way less words… as we focus on – listening to.. riding.. feeling.. grokking .. whatever.. the waves. Serendipity means a “fortunate happenstance” or “pleasant surprise”. It was coined by Horace Walpole in 1754. In a letter he wrote to a friend Walpole explained an unexpected discovery he had made by reference to a Persian fairy tale, The Three Princes of Serendip. The princes, he told his correspondent, were “always making discoveries, by accidents and sagacity, of things which they were not in quest of”. The notion of serendipity is a common occurrence throughout the history of scientific innovation such as Alexander Fleming’s accidental discovery of penicillin in 1928 and the invention of the microwave oven by Percy Spencer in 1945. Serendipity is not just a matter of a random event, nor can it be taken simply as a synonym for “a happy accident” (Ferguson, 1999; Khan, 1999), “finding out things without being searching for them” (Austin, 2003), or “a pleasant surprise” (Tolson, 2004) ..
diff between random and whimsy.. perhaps what makes the chaos a dance.. The New Oxford Dictionary of English defines serendipity as the occurrence and development of events by chance in a satisfactory or beneficial way, understanding the chance as any event that takes place in the absence of any obvious project (randomly or accidentally), which is not relevant to any present need, or in which the cause is unknown. i’m guessing we all have this ability. we just haven’t given most of us (so any of us) a chance. The serendipitous can play an important role in the search for truth, but because of traditional scientific behavior and scientific thinking based on logic and predictability is often ignored in the scientific literature. spot on – but do we need the national curriculum? isn’t that a compromise as well?isn’t this unleashing about curiosity, and the natural process of learning. why impose content strands?.. while the nat curriculum may be better.. it’s not the best is it? It’s as though we went as far as we could, in our own heads, then leapt outside of them, into cities, and left our heads behind. -3 paragraphs up from the end.do you think our heads, or enough of our heads, or enough of our heads and others’ heads with the use of the web, have caught up enough that now we can make the cities us? we stare down into our screens, and find within them a connection we had almost forgotten. It touches something so ancient – and so long ignored – that the mobile now contends with the real world as the defining axis of social orientation. People are often too busy responding to messages to focus on those in their immediate presence. It seems ridiculous, thoughtless and pointless, butthe device has opened a passage which allows us to retrieve this oldest part of ourselves, and we’re reluctant to let that go. so – shouldn’t we be more about using those devices for conversations..(than standards) deep tacit knowledge conversations. that lead to trust based relationships, that lead to bringing people together. These kinds of things have been possible before, but the National Curriculum gives us the reason to do it. i think the reason to do it is because each of us has curiosities deep within.. the nat curric is if we didn’t have access to these connections. on new networks.. we thought – i’ll use it to help me find info, etc.. but what we actually did was communicate and share. our desire to communicate with one another has turned out to be one of the most stable features of the current environment. the answers are more in the opportunities (creating serendipity) for each other by the culture of the groups we form..is your plexus what we’re looking for? is someone in ed testing it out, can we test it out? do you have yet a space on plexus where you can have a coffeehouse convo? jetsons quality? i can’t seem to read your posts fast enough. if you can find someone who is creative and get them to define what they do, then if you do it, you are creative..
seeking to show (whoever) the capability of a community listening to itself with the use of tech that allows for transparency, lurking until trust and connection and understanding is established, because of the affordability of a 24/7 ongoing convo… [rather than a one hour session when many might be gathered in a space, and until that trust is built.. via Oscar Wilde..and the power of ego, and the lack of soul peace… most people are other people. ]…the capability of that listening to self, to each other, without an agenda, in order to crowdsource communities of practice, gatherings that matter… [if via ed: so that govt funding for Ed at least could then be per census rather than seat time, st tests, etc.where the focus is on self-assessment, via this process of learning], and in fact, this process (detox) is also used, via app/chip, to create serendipity, much like seeclickfix is used to fix potholes… allowing us to break down walls, and listen to the sound of silence, to see, and better connect to, the invisible.busyness turns into betterness. on wandering and mind wandering and wilderness …..and whimsy. tacit knowledge exists only in people’s heads.. you’ve got to stand next to someone who already knows and learn by doing. It’s not enough to ask where good ideas come from — we need to rethink how we go about finding them. because we can’t predict which ideas will collide and fuse, we cling to boring productivity and efficiency. We not only run our lives but our entire economy this way, using GDP and even grosser statistics to measure progress that has never unfolded in a straight line. Life is emergent and unknowable — we’re just terrified to manage it that way. And because we only attribute our success to serendipity after the fact (if at all), we typically consign it to anecdotes (e.g. Post-it Notes), turning to them only when the numbers don’t add up. The problem is that more and more of the most important numbers — including patent applications, R&D budgets, and even economic growth — have stopped adding up. if they ever did.. no? imagine we let self-talk be our engine.. toward perhaps optimal and ongoing serendipity..
It’s no accident that the Watson Research Center produces more patents per year than any other building in the world, and IBM more than any other company. patents et al – a means to stifle serendipity… careful not to perpetuate it by using it as a measure.. no? Burt’s findings have been borne out again and again; in one study, a slight increase in serendipity generated more revenue and projects while speeding up their completion. money … a means to stifle serendipity… careful not to perpetuate it by using it as a measure.. no? Even Google cancelled “20 percent time,” its celebrated policy of granting engineers one day a week for personal projects. To capture serendipity, the company is looking at space instead of time — hence the design of its new campus, in which everyone is just a short “casual collision” away. What makes a city great, in other words, is how well its people are connected — to the city itself and to each other. And to make a city better, you have to engineer serendipity. Which is what Tony Hsieh is trying to do in Las Vegas. So, what if we borrowed Ayasdi to power a social serendipity engine — one to identify who’s nearby, parse our hidden relationships, and make introductions? How would it work? We’d want it to be as easy as Tinder, which now owns half the mobile dating market. Next, we’d need context — why do I want to meet this person? Tinder works because its logic is binary: Swipe right or left. Everything else is harder. I’m staking my own claim: Serendipity is the process through which we discover unknown unknowns. Understanding it as an emergent property of social networks, instead of sheer luck, enables us to treat it as a viable strategy for organizing people and sharing ideas, rather than writing it off as magic. And that, in turn, has potentially huge ramifications for everything from how we work to how we learn to where we live by leading to a shift away from efficiency — doing the same thing over and over, only a little bit better — toward novelty and discovery. so yes. groundhog day ness. iterating detox till we get to eudaimonian surplus.. ness. @mikeryan Thanks, but these days I really need to conserve all of my indignation for Uber. only for things like assuming money, work, et al… systemic cleansing ness. let’s do this first… serendipity to the max .. sure to follow. you can explode with abundant serendipitous encounters all you want.. if people aren’t awake.. makes not enough diff. or perhaps… more about noticing the strings all around us..
rev if every day life. *That’s why we need to develop a new, interdisciplinary field — call it serendipity studies — that can help us create a taxonomy of discoveries in the chemistry lab, the newsroom, the forest, the classroom, the particle accelerator and the hospital. By observing and documenting the many different “species” of super-encounterers, we might begin to understand their minds. *or perhaps.. why we need to experiment.. with a real rat park ness for people.. ie: free everyone.. at once.. trust that.. in the city. as the day. One day we might be able to stumble upon new and better ways of getting lost. Louis Pasteur, states that, “Fortune favors the prepared mind.” This is absolutely true… But, what exactly is a prepared mind? What makes us receptive to chance events, and able to capitalize on them? let’s try 2 convos .. as the day..